People who've heard of Kanchanaburi mostly related it to war memorials and legends of war casualties. The town itself was even created to be a defensive outpost by Thailand's King Rama the 1st in the late 18th century. 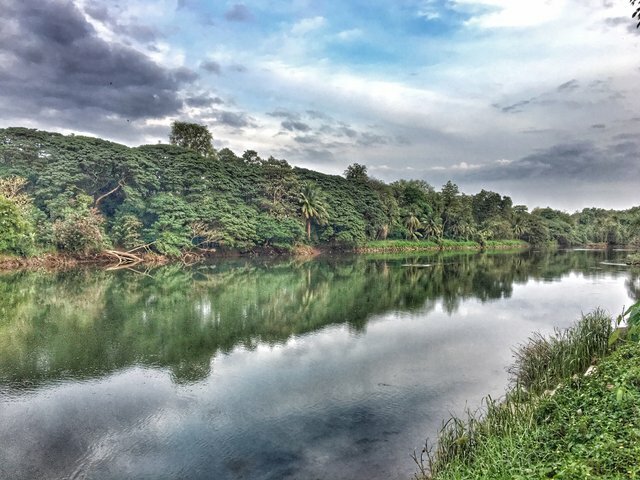 People who've visited Kanchanaburi however, know it as another form of paradise. The famous bridge over Khwae Yai River was built on the disappointments of humanity at a time when the world was at its darkest hour. In our modern era though, the waters that flow under that bridge has given life to a small town of over 30,000 people. The paradise of Kanchanaburi is represented by destinations like Erawan National Park and the lake made from the Srinagarind Dam. On the reservoir's waters are houseboats that are attractions of their own with the quality of service ranging from 2 to 5 stars. Some houseboats are so modernized that they rival any 5-star hotel while naturalistic houseboats are still available for the wild and rugged type adventure. 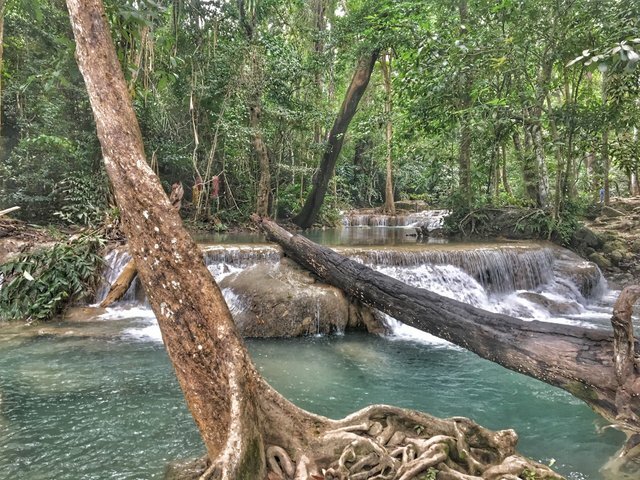 Inside Erawan National Park is the world renown Erawan Waterfalls which is named after the 3 headed white elephant in Hindu mythology. This 7 tier waterfall takes roughly 3 hours to reach the top. A safe estimate would be 6 hours to dip in all the emerald pools from all 7 levels and to explore all the caves. The first 2 tiers are more family friendly with swimmable pools for children while the third tier and beyond takes quite a bit of effort for people who don't exercise. 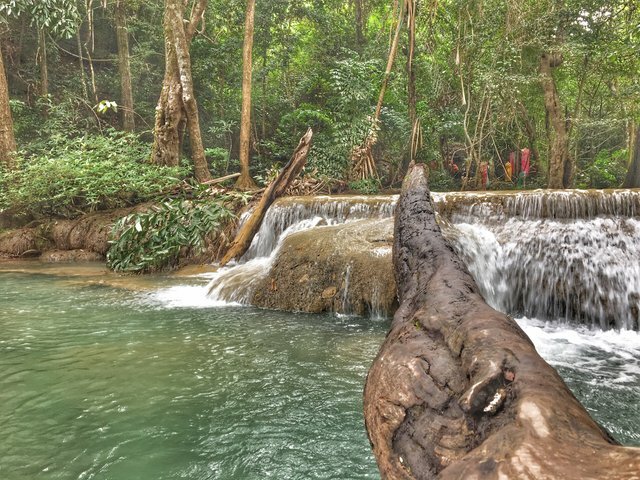 Most visitors leave in awe of nature because at Erawan Waterfall, there's a level for everyone. My brother the @gramurai and his family was visiting us for 3 weeks and we made the most of it. He always asks me not to buy my nephews and niece toys and clothes but spend the resources on experiences that will last a lifetime. This was our Kanchanaburi leg of our beloved family reunion and we started on Khwae Yai River at The Princess River Kwai Hotel. 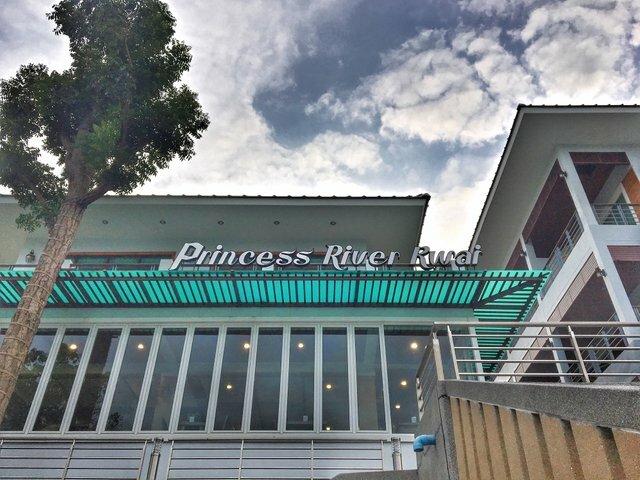 The Princess River Kwai Hotel is riverfront equipped with kayaks so guests can explore some of the town's naturalistic wonders on the river. We had 5 children with us so we were grateful for the hotel's swimming pool and easily accessible restaurant. Our kids enjoyed themselves so much swimming and looking at dragonflies that nap time was a breeze. The staff was attentive, the groundsmen were friendly and the owners seemed like they loved what they were doing. It was an enjoyable visit that seemed like we were staying at a family member's house, with 4-star style treatment as an extra. We checked out with watermelon and passion fruit smoothies and a promise to our kids to fulfill. That promise was to go down the biggest water slide on Kanchanaburi's gigantic water reservoir. 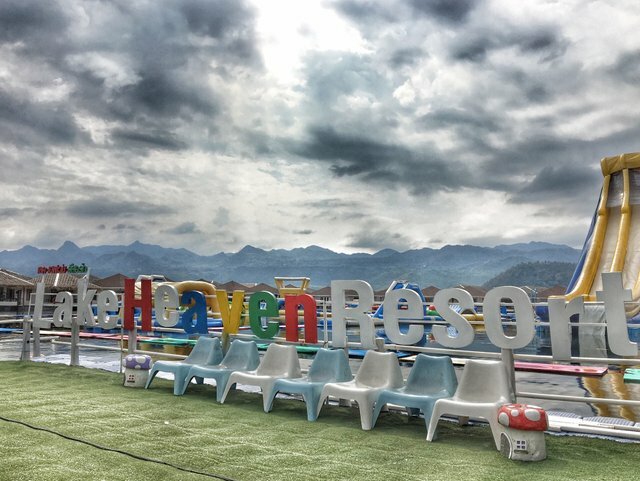 We arrived at Lake Heaven Resort mid-day and instantly changed into our swimming attire after check-in. The adventurous allure of the resort's enormous slider was too great to resist. At least too great for the big kid in both me and the @gramurai, LOL. After the @gramurai took our 10 and 7-year-old kids out for a round of the resort's water obstacle course, it was time for us big boys to tackle the mountainous water slide full of air. It was a steep climb to the top of the super waterslide and when we got up top, we both paused to catch our breath. It wasn't like being in the championship rounds of an MMA match but rather we both wanted to get the full thrust from the waterslide's handles. As we counted down, I catapulted myself down with all my might and ended up hitting the side bumper close to the bottom. This resulted in my body involuntarily turning head first as I launched off the ramp catching big air. It was all so fun as I was laughing like a kid all the way down until my face and chest hit the water from that big air. Ouch...make that double ouch, LOL! When I emerged the on-lookers had the "I know that hurt" look on their faces until I started to laugh, and then they all started laughing with me. 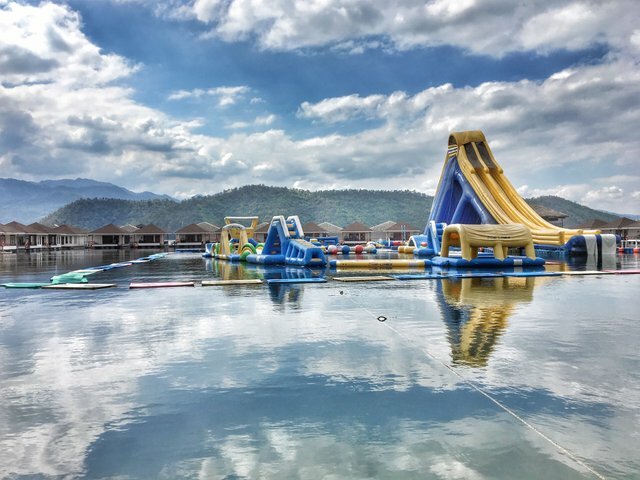 The rest of the time at the resort was really easy because I had the small kids of our family as the @gramurai took our older kids through the resort's water obstacle course. 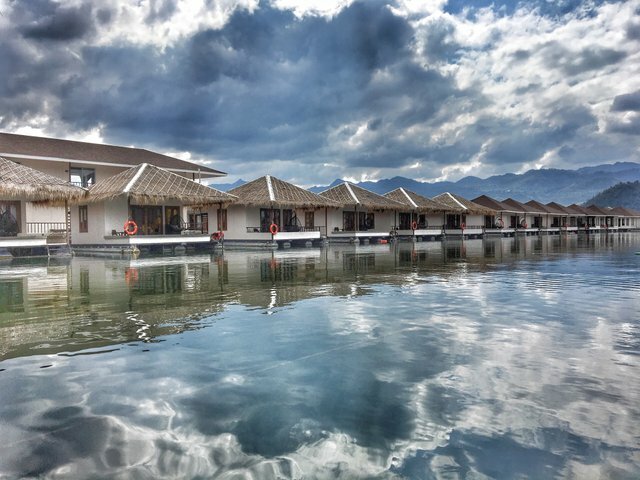 The lodging at Lake Heaven Resort was at 4-star level and provided everything we needed for our families to enjoy their adventurous stay as well as rest up for a day at Erawan Waterfalls. 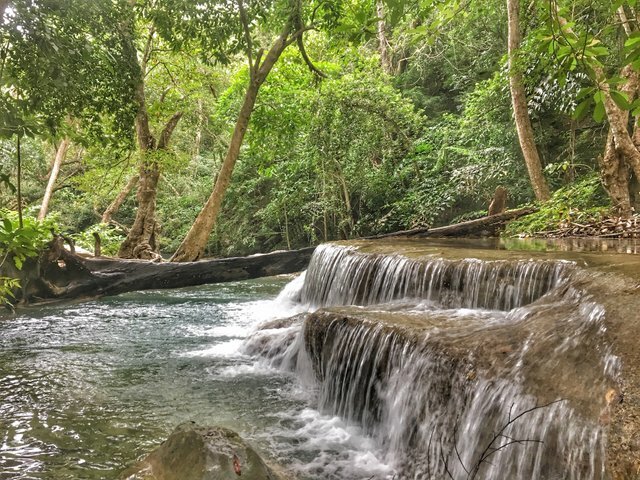 Erawan Waterfalls is world renown because of its emerald waters and gorgeous emerald pools on all 7 levels. We had 5 kids with us, with 3 being small so we decided to set base at the 2nd tier. When we arrived, it amazed me as much as it did the previous time. 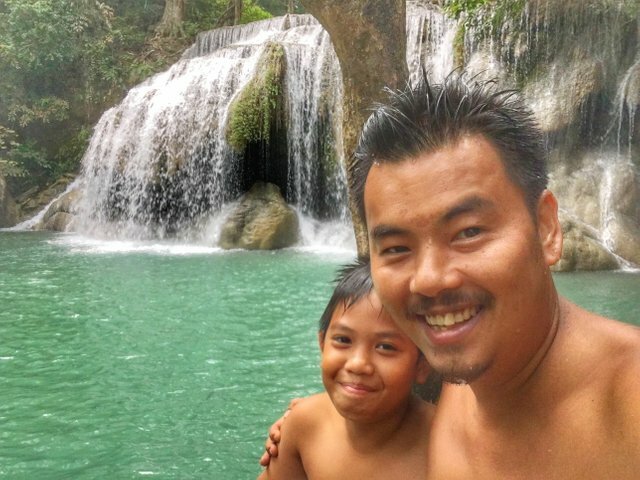 We set our things down and took the kids to a shallow part of the 2nd tier and switched off swimming to the gorgeous cave that lies beneath the falls. In the mesmerizing emerald pool, the fish ate the dead skin off our feet and even off my body as I swam to the cave. I reached the entrance with my eldest grandson and swam underneath the falls to give it a Hollywood effect, LOL. We jumped up on the rocks and started exploring the small cave. We sat for a long moment to enjoy the serenity inside the waterfall's cave. The swim back to our family made me realize how great of a swimmer my 10-year-old has become and for that, I am grateful. I spent the rest of the day near the shallow end with the smaller babies and admiring the natural surroundings. I felt a sense of peaceful calm as I watched all the other families and tourists enjoying the magical waters. As these images replay in my mind, I realized I was in the paradise of Kanchanaburi. Super happy that you enjoyed the post and have an incredible week. @berniesanders, I was super excited to see your post, I thought you came by to read the write-up, LOL. I know you're in that high level of Steemit politics, great luck to you and thanks for stopping by anyway. Have a great rest of the week. Thanks a million yall, I appreciate it more than yall will ever know. Glad you enjoyed the post. The water was surreal but I didn't see any monkeys this time. Last time I saw plenty. They were probably on the higher levels. Have a great rest of the week. Very nice, I miss there. Kanchanaburi. And Kanchanaburi misses you! Always a pleasure when you come by and have an amazing rest of the week. Super happy you like the images. I didn't have my waterproof equipment so I couldn't get pictures of the caves. Next time for sure and have an incredible rest of the week. wow this place is very nice... i also interest this place... hopefully oneday i go to visit. You're going to love it. I would say when you do, try to stay at the bungalows at the waterfalls so you can climb all 7 levels in the morning :) Many thanks for coming by and have a wonderful rest of the week. thank you for your... information. What an awesome place and that bouncy water playground with the slides would of been so much fun even with the ouchies. Thanks for sharing, great quality photographs. It was a blast and our kids absolutely loved it :) Thanks for coming by and have an awesome week! It really looks like Paradise! Who doesn't wanna be there! The waters were crisp, cool and refreshing. Our kids had the times of their lives. Thanks for coming by and have an outstanding week! Glad you enjoyed the post and have an awesome week! Super happy you liked the write-up and thanks for stopping by. Have a great rest of the week. 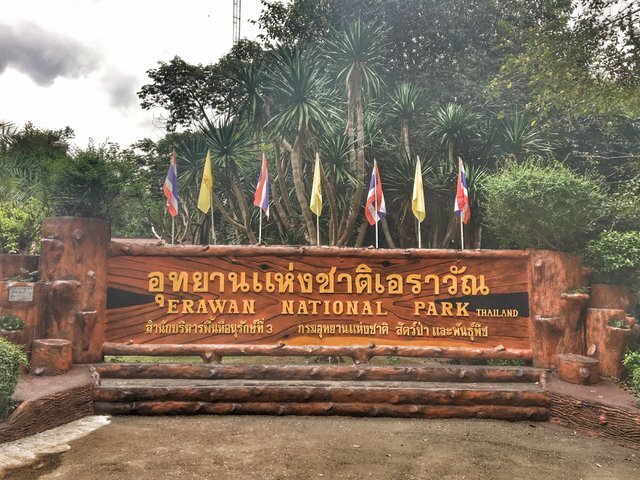 Yes, Erawan National Park is a couple hours outside of BKK. The waterfalls has 7 levels of gorgeous emarld waters. Thanks for coming by and have a marvelous week. Of course yes I have been it's very nice place spent the weekend there and saw a wild elephant! Beautiful pics! I've never been to Thailand, but would like to visit it. Glad you liked the images and you're gonna love it when you do visit. Thanks a million for stopping by and have a superb rest of the week. You're going to love it. The waters there are magical and an emerald color. Thanks a million for coming byb and have a great week. Super happy you enjoyed the post. The waters were magical there. Thanks for coming by and have an amazing rest of the week. The waters felt amazing. Super glad you liked the post and thanks for coming by. Have a great weekend! Cool picture with combination with a cool post. I hope you enjoy 3 weeks visits with family. It's always legendary when you can experience it with family :) From my family to yours, with love. Thanks for coming by and have an amazing weekend.